The name Silvertop was given to the 4th generation of the 4A-GE engine. It's not an official name given to it by Toyota, but Toyota enthusiast started to use it to identify it from the other 4A-GE variants. The reason why they gave it that name seems pretty obvious: The valve covers and protection plate are all silver colored. When the 4A-GE's with the 16V heads couldn't be improved upon any further, Toyota decided to design a completely new cylinder head, but this time with 20 valves. 5 Valves per cylinder (3 intake valves and 2 exhaust valves). A Toyota 4A-GE 20V Silvertop engine. This engine was introduced and used in the AE101 Sprinter and Corolla models for the Japanese domestic market to compete with the rivaling high revving Honda V-TEC engines. 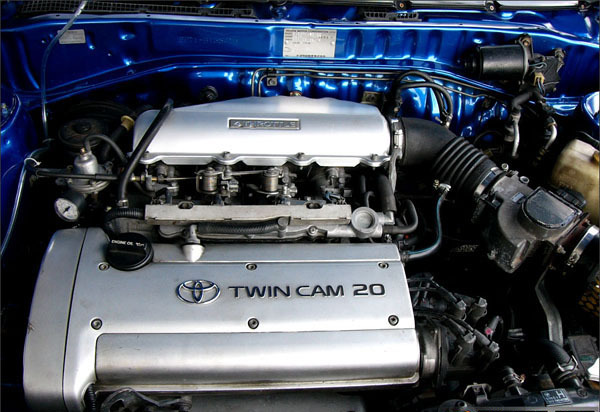 To set it apart even more from the stiff competition, Toyota used 5 valves per cylinder and a intake system with individual throttle bodies to provide each cylinder with its own throttle valve. Something found more on race car engine than in a every day family car. Toyota also used a very early form of its VVT (variable Valve Timing) system on the intake camshaft. With this system the intake camshaft could be rotated slightly to alter the overlap between the intake and exhaust valves. And where the earlier variants of the 4A-GE were already pretty rev happy, the 20V engines trumped them there. The red area on the rev counter starts at a whopping 8000rpm! This, together with the ITB intake system made them real screamers with a really nice soundtrack and a very good throttle respons. +/- 155 hp @ 7400 rpm. 162 Nm @ 5200 rpm.